I suspect that many of us have gotten away from making our own Cinnamon Rolls as we think they are just too much work and take too much time. However, we need to realize that a yeast dough is really not any more difficult to make than a cake batter. The differences are that we are using yeast and that the dough does need to rise, although during this time we can be off doing something else. I love how these Cinnamon Rolls have a soft and tender crumb and that is because the dough contains butter, eggs, and milk. Keep in mind that this rich yeast dough will take about 1 1/2 to 2 hours for the first rise. Then, all you need to do is roll the dough into a square, sprinkle it with a sweet filling made of brown sugar, ground cinnamon, flour, and butter, roll the dough into a cylinder, and cut into eight individual cinnamon rolls. Next, the rolls are placed in a greased 9 x 13 inch (23 x 33 cm) baking pan (I like to use a glass pan) and covered with a sheet of lightly greased plastic wrap. Now, while you can let the rolls rise and then bake them off the same day, I often like to place the unbaked rolls in the refrigerator overnight. 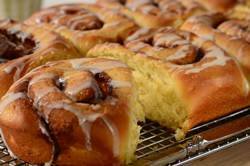 This is perfect when you want to serve freshly baked Cinnamon Rolls for breakfast. The unbaked rolls rise slowly in the refrigerator overnight, so all you need to do the next morning is take the rolls out of the refrigerator and let them sit at room temperature while you heat up the oven. Then just bake them and you have hot Cinnamon Rolls that everyone will enjoy. You can eat these just as they are or, where I come from, we like to slice them in half, place them under the broiler until nicely browned, and then slather each half with butter. Cinnamon Rolls: In the bowl of your electric mixer, fitted with the paddle attachment (can use an electric hand mixer), combine 2 1/4 cups (295 grams) flour and the yeast. In a small saucepan, stirring constantly, heat the milk, butter, sugar, and salt just till warm (about 120 degrees F) (50 degrees C) and the butter is almost melted. Gradually pour the milk mixture into the flour mixture, with the mixer on low speed. Add eggs, one at a time, beating well after each addition. Scrape down the sides of the bowl. Then beat this mixture on high speed for 3 minutes. Replace the paddle attachment with the dough hook (or knead by hand), and knead in as much of the remaining 2 1/4 to 2 3/4 cups (295 - 365 grams) flour until you have a soft dough that is smooth and elastic (3 to 5 minutes), but not sticky. Shape the dough into a ball and place in a greased bowl, turning once. Cover with plastic wrap and let rise in a warm place until almost doubled (approximately 1 1/2 - 2 hours). Then gently punch the dough to release the air and let rest for 10 minutes. Roll the dough into a 12 inch (30 cm) square. Sprinkle the filling evenly over the rolled out dough and top with raisins (if desired). Lightly brush one end of the dough with a little half-and-half or light cream (to seal the edges of the rolls). Roll the dough to form a log, starting at the end opposite the edge you brushed with cream. (Do not roll the dough too tightly or the centers of the rolls will pop up during baking.) Slice the log into eight equal-sized pieces. Arrange rolls in a greased 13 x 9 x 2 inch (33 x 23 x 5 cm) glass baking pan. Cover rolls loosely with lightly greased plastic wrap, leaving room for rolls to rise, at room temperature, until almost doubled (about one hour). (At this point you can refrigerate the Cinnamon Rolls overnight (up to 24 hours). Next morning, remove the rolls from the refrigerator, take off the plastic wrap, and let stand at room temperature for about 30 minutes.) Break any surface bubbles with a toothpick. Lightly brush rolls with half-and-half or light cream. Bake in a 375 degrees F (190 degrees C) oven for 25 to 30 minutes or till light brown, and a toothpick inserted into one of the buns, comes out clean. Also, if you lightly tap on the top of the buns they should sound hollow. If necessary, to prevent over-browning, cover rolls loosely with foil the last 5 to 10 minutes of baking. Remove rolls from oven. Brush again with half-and-half or light cream. Cool 5 minutes and then invert onto a baking rack and re-invert onto a serving plate or platter. Can drizzle with the Powdered Sugar Glaze.